Senior Mikayla Tinus performs Rhiannon. The audience in the Performing Arts Center Saturday night was so still it might not have been there at all. All that could be heard were the clear bass and tenor harmonies of Soundwaves, an all-male a cappella group formed this year by high school senior Galen Mayhew. The group finished its set, closing with an original medley of Imagine Dragons songs, and the silence of the audience broke with a soaring round of applause. Galen mouthed “Good job” to the other five members as they left the stage. The group’s debut performance was a new part of the annual Minnesingers spring show, held Saturday night and Sunday afternoon. The evening blends choral music with danceable tunes to showcase the Minnesingers’ impressive repertoire. The evening began with a selection of choral performances ranging from a 16th century madrigal to 20th century gospel arrangements. Dubbed Morn to Night, the choral portion took the audience through the course of a day, closing with the John David composition You Are The New Day. The Soundwaves took the stage for their three-song set, and then the British invaded. The dance portion of the show featured selections from across the pond—everything from Herman’s Hermits to the Spice Girls. After a bouncing welcome by Sgt. 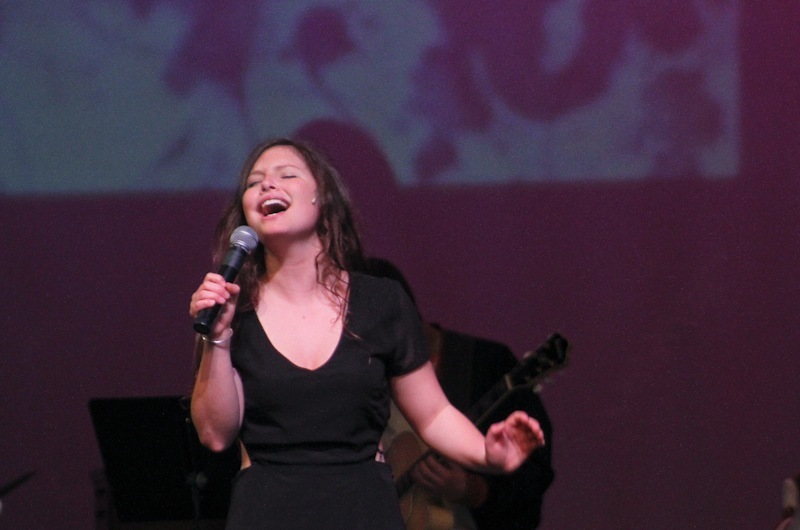 Pepper’s Lonely Hearts Club Band, junior Katherine Reid performed a stripped-down yet powerful rendition of House of the Rising Sun, accompanying herself on guitar. The Minnesingers’ main talent may be singing, but a quick glance through the lineup shows their versatility in other instruments as well. Junior Erik Faber accompanied two fellow Minnesingers on guitar, while senior Sophie Nelson provided piano on Sam Permar’s solo of Disclosure’s Latch. Seniors Mikayla Tinus and Sarah Ortlip-Sommers dueted on a Florence + the Machine number, with Tinus playing guitar. And for those numbers when the full company was onstage, the Minnesingers band was there to back them up. Being the dance portion, choreography was also of utmost importance, with the My Generation and Bennie and the Jets numbers both highlights (the latter spotlighting Grant Santos' impressive falsetto, which had the audience in stitches). For the closing number, senior Emelia Cappelli performed Yellow Submarine as the sophomore and junior Minnesingers sang backup with their classmates. The seniors stepped on stage last, taking one final bow. Awesome show. Saw it Sunday. What a talented crew !